RB: For more than 25 years Rich Mintzer has been a professional writer. During that time he has been the author or ghostwriter of more than 65 published nonfiction books, including a dozen business books for Entrepreneur Press. His diverse portfolio also includes books on health, golf, personal finance among other topics. His client list has included Disney, Cablevision, Merck, Weight Watchers and many more. He’s a firm believer in the power of a book to help promote, market and build a brand or tell a story for his ghostwriting or coaching clients. For the last three years, Rich has run, Your Book Your Way, at www.yourbookyourway.net, a ghostwriting, editing and coaching service. He’s also an expert in writing book proposals for those seeking to land their books with traditional publishing houses. And whenever possible, he now enjoys public speaking where he talks about what he knows best, writing. Rich, welcome to the show. RM: Thank you, I’m glad to be on it. RB: Awesome. So let me ask before we jump into things, how did you get started writing books and being a ghostwriter? RM: Well, I started writing comedy for stand up comics and trying to be a comedy writer and write for television. Being in New York, that wasn’t the best place to be and we never managed to settle in California, so I switched over to books. Somebody asked me if I would write a humor book and I did. It was on the nursing profession, which I knew almost nothing about. So I wrote the The Unofficial Nurses Handbook, and it was a comedy book that sold about 100,000 copies. So I decided I like books and I did that for about 10-15 years. Somewhere around 2005 someone who was a coach in the ADD world decided that she needed a book and her agent knew she couldn’t write it herself so she decided to contact me to ghostwrite for her and we got a very lucrative deal from a publishing house and suddenly I became a ghostwriter. So I’ve been doing both for the past 10 years or so and it’s been quite a lot of fun. RB: That’s cool to hear. Now obviously there’s a lot of entrepreneurs and marketers who listen to this podcast, why do you feel that books can benefit entrepreneurs? RM: I think it’s a great marketing tool, it’s a great way to brand. 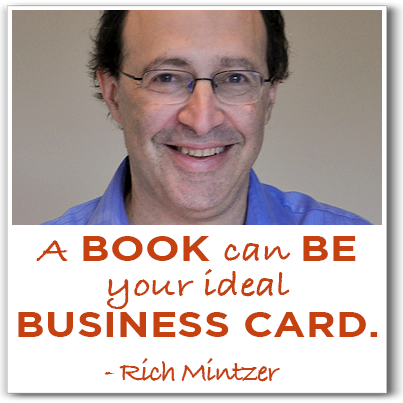 As one marketing expert said to me, “It’s the ideal business card.” It’s something that if people are looking for someone to work with, they will look for the person who has the book credentials over the person who does not. It just gives them a little extra credibility. If you’re in a doctor’s office and you see his book on your desk and you were in another doctor’s office, you would be inclined to go with the guy who wrote the book. He knows more about this, he’s the expert. I think it really can do a lot for someone in terms of spreading themselves around, what they do, their brand, their marketing and what their company is all about. I can give one, quick example. I wrote a book for a gentleman named Jeremy Bloom who was an olympic skier. When he got to the Olympics he finished 6th, and 4 years later he finished 9th. He wrote a book called, Fueled By Failure, because he went on to open a company out in San Francisco in tech tech marketing business and has been very, very successful. What his book did is it told the story, it motivated people and it inspired people. It marketed himself, his brand and obviously the company. So I think that’s a perfect example of what a book can do for someone. RB: I concur with that. In fact, I remember a few years ago trying to get into a particular conference that was being put on and when I looked at the bios to see what kind of credentials these people have, almost every bio started with, “the author of…”. So I definitely know that from my own experience it definitely helps you open doors when it comes to professional speaking. RM: Yes it does. All speakers should have books, and they know that. One motivational speaker I know in Texas said he didn’t make a lot of money off the book, but he doubled his speaking engagements and tripled his fees. So that’s making money off the book. RB: Absolutely. Who do you think benefits the most from writing a book? RM: I think professionals in a field, business owners, people who have had experience using their expertise and their passion who really know their field can do wonders with a book. They can really cement themselves as the expert and the person who the media will call. I think it’s a tremendous tool to speakers and I think it’s also a good tool to people who are just getting off the ground. Maybe they have a business that’s been running for a few years and they say, “What can I do to make this business stand out a little more?” And if those people read about the expertise that business offers, they’ll come back. They’ll feel like they know that business a little more. So I think those are all prime candidates. RB: Ok. Now I do the internet marketing thing but I also run my own small business. I’m sure that a lot of small business owners feel that they have a book in them, but they can’t seem to find the time or the motivation. What do you say to people like us? If you look at every major success story almost every single one has some people in place around them and behind them who did the things that the major successful person was not good at. We all have our expertise, but I think it’s important to say, “Look, I really want to do this but can you guide me through it?” That’s what I think people should do, and it’s not much time as people think it is. It’s a few hours a week talking to a ghost writer or getting coaching and wither letting the ghost writer do the work or taking a couple hours away from the television set and doing the writing yourself. RB: Alright, let’s say that we decided that we are going to go ahead and write a book and for whatever reason – a ghost writer is a great option – but if that’s not the right option for us and we really want to write it ourselves, what are some of the ways in which we can get started? Moving it from this idea of, “oh, I think I have a book inside me,” to actually putting pen to paper or start working on the keyboard. RM: When I do speaking engagements I always tell people that they should choose a subject they’re comfortable with or they know a lot about and are passionate about. It’s very hard to write on something you have no interest in. Since you’re an entrepreneur, you should be interested in your business and what your business does. I then tell people to break it down to the sum of the parts and probably make a list of 50 things that are part of what you do or what your business does and what your expertise is. So if somebody’s writing a book on planning a wedding, that entire list of items like flowers and invitations, you can go on and on and you can do that with almost any company and any business about all the different things that go into it. That’s what people need to start with, just thinking about all the things they could write, and just making a long list and narrowing it down to what they most want to write about and what’s most important to other people. this could come from their own, personal stories or could be a how to book or an inspirational book. But listing a lot of different things that are part of their world, their story, their passion gives them a little bit of an outline to start with. RB: Ok, so one other concern that I might have if I was going to sit down and write a book, does anybody really care, is their going to be a readership for this? Do you ever help people decide – or is there any research we can do ourselves – to determine if there’s an audience for this out there or do we try and built up our audience before writing this book? RM: Well, it’s a little of both. People do want to have a platform and an audience out there, that helps. Social media is good at that because you can get hundreds of thousands of people to know your book is out there. But I think it’s also important to do a little research, so look out there and see if such a book like that exists. If it does exist, see how many there are, see if you have a different angle, a unique slant, a different story to tell, something that makes it unique. Even a new kind of presentation would help. There are tons of cookbooks, I’m sure they overlap, but it’s the way they present it and put it together and package it that makes them unique. And then there’s also books that you’ll find no competition which means it might not be popular right now or it may be a very small niche market, and it depends on what you’re looking to do. If you have a small, local business, you may just want the readers in your community to read your book. So it kind of depends on what your goal is, so you should do some research, definitely look around and see what’s out there and what you could do differently. RB: Ok. One of the things that I’ve heard from some of my friends who are in the process of writing books or that have successfully published books is that a lot of the traditional publishers now are looking for authors to come with an audience in hand. Like with a mailing list of 10 or 20 thousand people before they start to take them seriously. I’m curious, is that your experience, and if so, how do we build this audience before we approach a publisher? RM: Yeah, that’s very, very true that traditional publishers are now more concerned with the platform and the following than they are with the book. That’s why Lena Dunham from Girls will get a $3.5 million book deal because she has a lot of followers. Whether it’s a good book or not, you will see them looking for the people with large audiences. In fact, I ghost wrote a book for somebody that got a book deal because he had 200,000 followers on Twitter, not that he had anything amazing to say. So the thing to do is to start building your social media contacts as much as possible. If you can start tweeting and getting on Facebook and do everything you can to build that audience as much as possible. And also, if you can get small speaking engagements and talk about what you know locally, you start to build a following. Any way you can get people behind you is important. The other thing is to write articles for publications or websites, again, show your expertise and get your name out there. It’s nice to have 10 published articles when you come in for a book proposal, it helps a lot. It’s very true, they really want people with platforms or celebrities in the traditional publishing world, which is why 55% of books now are self published. RB: Well that is the perfect lead in to my next question. In traditional publishing or self publishing, what’s right for us? RM: Well, for most people these days self publishing works. It works because you have more control. I mean, you have to put a little money into it, but it’s a good investment in yourself, you have control and you don’t have to worry about being selected to a traditional publishing house. You also have the opportunity to get your book out more quickly, traditional houses are usually on a spring and summer schedule, so if you write a book now it might not be out until the fall of 2016. If you self publish, you can get it out more quickly. Self publishing now – unlike the olden days – thanks to technology the books look great. You can’t tell just by looking at a book whether it was self published or not these days. And you can get your book on Amazon and Barnes and Noble, which are the big booksellers, So really the only difference is they’re not paying you to wrote the book, and you’re putting up some money. But if you put up $2,000 and you sell 200 books at $20 a pop, you’ll make your money back and then maybe come out ahead and then make some money. I always tell people, “Don’t think that your book is going to be a best seller.” Don’t write a book because you’re going to make a fortune, you probably won’t. But you can build your business and increase your speaking opportunities and brand yourself and all that. that’s where you make the money. I suggest self publishing to most people unless they have a very big following or they are a celebrity in some area. RB: Alright, so for most entrepreneurs and marketers of small businesses it sounds like the path to book success is a self publish route. Do you have any suggestions, like what does it take once you’ve created this book, are there companies out there that will help us get into Amazon and get an ISBN# and all that sort of stuff, or is there a better process to that? RM: No, there are some good companies out there. Some people want to try and do everything themselves and it’s a difficult and slower way of doing things. It’s like trying to cook something without a recipe instead of having the guidance of a recipe. With the guidance of a self publishing company they can put it together, they can put it in ebook form, it’s just easier. CreateSpace, which is Amazon’s version of self publishing. It’s a very popular place to go and a reputable one. There are other very good ones to go to, they just need to be aware of what they’re paying for. There are a number of these places that will throw in all sorts of costs, and that shouldn’t be happening. It should be you pay them to set up the book and cover, you pay for them to get the ISBN# – which is very inexpensive – and you pay for them to put the book together and then you pay for the books being printed. So if you’re paying $5 a book, you should be getting $15 if you have a $20 book out there. If they’re taking more money out, that’s not exactly what you want, you don’t want hidden fees. RB: Alright, that makes a lot of sense. So we get our book out there, people can buy it, even if we’re just envisioning this as a business card and a way to open up doors. Do you have any tips for marketing the book after it has been published, even if it’s some sort of publish on demand kind of situation? RM: It depends on what you’re good at and what the purpose is. Some people that have a book that’s going on Amazon and such, they want to get it to friends to write reviews, you want to get it to as many people as you can contact in social media and say you have a book and spread the word in conversation on Facebook and Twitter. Again, a lot of it is social media and going out and doing everything you can to spread the word that the book is out there. There were a couple of women in California who did a book called, Cooking With Trader Joe’s. And they didn’t do it through Trader Joe’s, they just asked if it was ok to use the name. Now they had a popular name on the book, so when they went out and marketed it, it grabbed people’s attention. They sold over 100,000 copies and then did another one. Now you probably won’t have that kind of a response to a book without a well known name, but you can get it out to a pretty large audience if you’re active and go on social media everyday and take some pictures and get it out to local bookstores or the library or any place in your area you can get into to. It’s a lot of legwork but people do it and books can sell fairly well. And people that have speaking engagements can put some books in the back of the room and sell a few each day. RB: Absolutely. So if we’re going to write our own books – a lot of the self published books these days are publish on demand – does it make sense to get a small run done up of like 100 or 500 books and bring them around if you are doing speaking gigs? RM: Yeah, it definitely pays to have a small run because it’s cheaper printing. A book that cost $10 to print, if you do 100, it might cost $4 to print. So yes, it saves you on printing. You want to have books handy, you don’t want to have a garage full of them, but you do want to have some books handy at all times, especially if you’re doing speaking gigs. RB: Have you had any problems or mistakes that you see people making when they’re trying to make their first book that you might be able to steer us away from? RM: Yeah, two things that people do. One is they go off on tangents about something and just sort of lose it for a while and then come back to it later. There was a woman who was a coffee expert and travels around the world doing articles about coffee, and for 7 pages she wrote about what she had done previously with war reporting. And I said to her, “You haven’t mentioned coffee for 7 pages.” So people tend to go off on these tangents and go into things that have nothing to do with what they’re writing about and then come back to reality. So that’s a problem. And the other is that people don’t edit themselves, which they can do later on. You may put something in the book and then decide later on that you don’t need it. So you take things out, it’s just overkill. If you want to talk about your business, you want to give a global feeling of the business and talk about it in a way everyone that picks it up can understand the nitty gritty of who made Vice President last month or the picnic in the park. Those kinds of things, too much information sometimes and tangents. RB: Alright, so keep the focus is what I’m really hearing. You’re writing a nonfiction book or a business book, you really want to keep the focus and maybe if you’ve got too many stories, save one for your next book. RM: Exactly, exactly, And be reader centric. Also stop and think, “If I were a reader, would I be interested in this?” You have to kind of look at it from the reader’s point of view. RB: Sounds good. A lot of good information here and I know that a lot of our listeners have been thinking about writing a book. They might need your services or want to learn more from you, Rich, where can we send them? RM: They can go to my website which is yourbookyourway.net, or they can email me at rsmz@optonline.net. RB: Alright, great. And we’ll have those links as always in the show notes. Rich, I want to thank you very much for your knowledge and your time today. RM: Thank you so much for having me on the show. Find out more about Rich Mintzer at his website. Got a question for Rich? Send it along to him via email at rsmz@optonline.net. One self-publishing option is CreateSpace, which is Amazon’s version. Like what you heard and are desperate to know more about the host? Rich Brooks is the fearless leader of flyte new media, a web design and internet marketing agency in Portland, Maine. He is also the founder and brains behind the Agents Of Change Digital Marketing Conference. He also fancies himself a witty tweeter, follow him on Twitter at @therichbroooks. This entry was posted in Entrepreneurship, Networking and Marketing, Social Media Marketing and tagged ghost writer, publish your own book, publishing books, rich mintzer, your book your way by Rich Brooks. Bookmark the permalink.